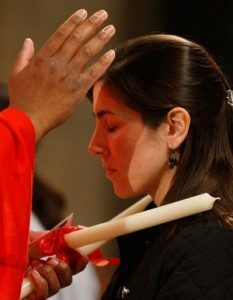 Traditionally on the Feast of St. Blaise, 3rd February, individuals are invited to have their throats blessed using candles that are blessed on the Feast of Candlemas (2nd February). The blessing of throats will take place after each Mass this weekend. Saint Blaise was the bishop of Sebaste in Armenia during the fourth century. According to various accounts he was a physician before becoming a bishop. His reputation spread throughout the entire Church in the Middle Ages because he was reputed to have miraculously cured a little boy who nearly died because of a fishbone in his throat. From the eighth century he has been invoked on behalf of the sick, especially those afflicted with illnesses of the throat.